Manfred Sauer the Company Founder was born in 1944. Manfred (pictured below with his pet dog Foxcil) has had tetraplegia since 1963 after a diving accident in the UK. He was rehabilitated at Stoke Mandeville Spinal Unit in the days of its founder Sir Ludwig Guttmann. In 1965 he began to develop and market reliable skin adhesives and urinary sheaths due to the poor performance of what was then on the market at that time. 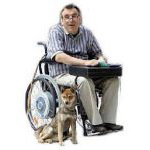 In 1976 he launched Manfred Sauer GmbH, now a firmly established business enjoying a large share in the Continence systems rehabilitation marketplace in Europe for people with neurological conditions such as Spinal Injuries, MS, Spina Bifida. If the products work for these patient groups they will work for everyone so in recent years there has been an increasing market share in mainstream continence management in the UK and throughout Europe. 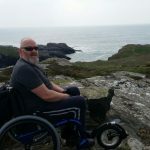 Recently Manfred has realised his dream in the shape the Manfred Sauer Foundation, a charitable enterprise to help with the psychological rehabilitation of people and their families after traumatic accident or illness. The below aerial photo is of the Manfred Sauer manufacturing facility and Foundation in Germany. 95% of all Manfred Sauer products are manufactured in Germany to EU standards so working conditions and environmental considerations are to the highest standards, allowing us 100% control over product quality, essential for our customers to know and be confident when using. Manfred Sauer UK was started up by Barry Kaighin in 1995 the UK Branch’s Managing Director (left in below picture). 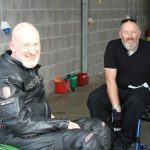 Barry has had paraplegia since 1988 following a road traffic accident. After working in the computer and record industries Barry became part of the international Manfred Sauer team, being involved in product development and expanding the business. When Barry started the only product the Company had available on UK prescription was the Bendi Bag. The current product portfolio has since grown to the most extensive and diverse available in the UK, with more options offered than any other company in the industry. In 2016 Barry successfully obtained the first new Dispensing Appliance License (DAC) to be awarded by NHS England in almost 20 years and thus was born Manfred Sauer Care, a DAC with a difference, brought to you by the same knowledgeable and efficient team behind Manfred Sauer UK. Barry is also vice-chair of the Urology Trade Association (UTA) campaigning from a Product User and Professional perspective to the NHS & Department of Health to maintain standards and product availability for all regardless of postcode within the NHS and Industry. We are always keen to help in any way we can and our helpline advisers collectively have over 70 years of personal experience using medical devices so you will not be speaking to call centre people reading off a sales script, you will be talking to people who really understand!